Reinsurance is not complicated but it is full of jargon. This 70 page booklet introduces the key ideas that are necessary to make an informed investment in insurance linked funds. Introduced by the former partner responsible for the Goldman Sachs catastrophe bond business, the guide systematically explains the funds and their underlying assets. 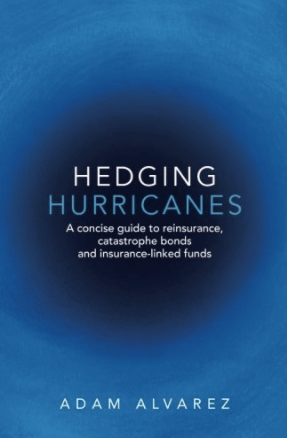 Previously published as 'Investing in Hurricanes' this edition was published in 2017. Alternative asset classes offer investors opportunities to generate returns that are weakly correlated to the debt and equity markets. Hedge funds, Real Estate Investment Trusts (REITs) and commodity funds as well as niches such as wine, art and stamp funds all promise absolute returns that are independent of the stock market. But we live in an interconnected world and experience has shown that, in stressful times, all of these strategies are affected by what is happening in the rest of the economy. Insurance-linked funds have experienced rapid growth in recent years by successfully making the argument that catastrophe reinsurance is an asset class that is less correlated than most. Whilst a financial collapse might cause people to buy less wine, stamps or art it won’t cause a hurricane, earthquake or tsunami. Reinsurance is not complicated but it is full of jargon. This guide aims to explain the key ideas that are necessary to make an informed investment in this sector. The first two parts outline the types of asset that an insurance-linked fund can invest in. Part one explains what reinsurance is, why it is bought and how funds can invest in it. Part two explains insurance-linked securities – newer structures that perform a similar function to reinsurance. Part three of the guide looks at the funds themselves. There is little consistency between the strategies of insurance-linked funds. Understanding the fundamental strengths and weaknesses of each approach might make a big difference to investments when the next loss happens. Sample chapter - Introduction to reinsurance. Users who have registered (for free) can read the foreword here.